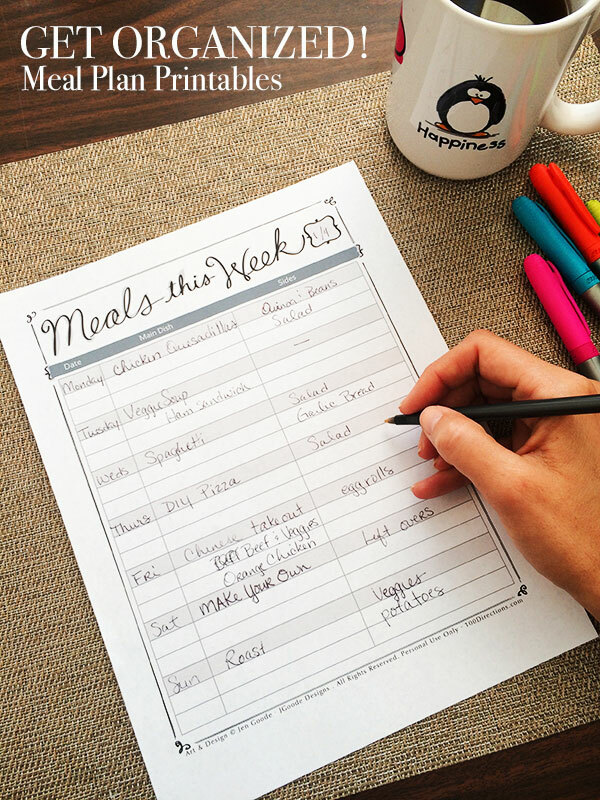 Jen Goode is back this month y’all with a free printable meal plan to help you get organized. Read below to learn more and print your own. Be sure to visit 100 Directions to see more from Jen! Getting in organized in the kitchen seems to be simple enough, if you have all the containers and the cabinet space. What about organized in the use of the kitchen? Do you stock your fridge and just make things up as you go, or do you plan your meals ahead? I have not been a meal planner, I never know what I’m going to be hungry for. This year I’ve decided we are going to save money and the first place to check costs is in our grocery bill. So getting organized with our meals and our meal plan is pretty important. SO, I’ve designed a set of printable meal plan pages to help with the task. I like to keep things pretty simple, so these printables were created for multi-use. Use them how your organizing works best for you. 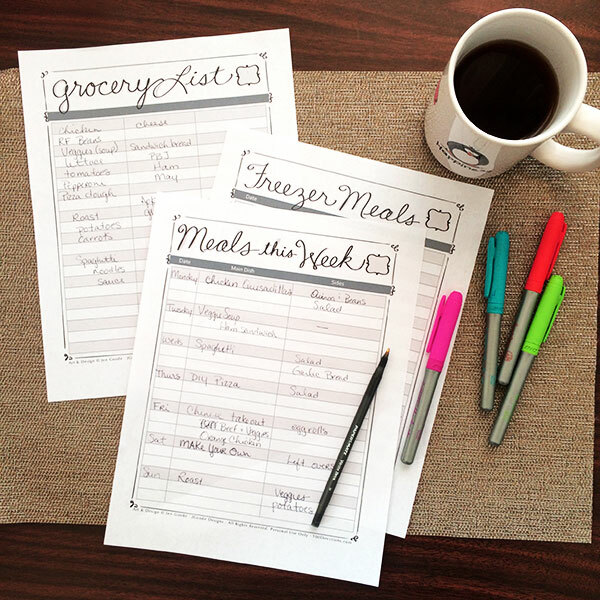 There is a meal plan page, freezer meals log page and a grocery list page. All designed with pretty little hand written and swirly accents. Print them out on colored paper or regular white. You can even add your own creative touch and color them if you’d like. For the meal plan page, there is a “date” column. You can plan out meals for months at a time if you want, I’m using the date column to specify days. In reality, I won’t even use the date column. I like to list off all the meal options available and then each day I pick which meal I want to make. This way, I still plan ahead, cut costs on the food budget, but have a choice to decide what I feel like eating each day. Tip: print out one set of these meal plan printables. Color them how you’d like. Then make copies to use so you only have to color them once. I like to list main ingredients for the meal and then side dishes separately. Sometimes I’m just tired of salad, so being able to see other ideas at a glance is super helpful. I just cross out the items we’ve eaten throughout the week to keep track. Sometimes, when I’m writing the meal plan out, I’m already hungry, so I come up with far more food options than we actually need. So, I just add those un-used items to the next week’s list. Being able to see what is available instead of digging through the pantry really does save time and money! I hope you love these meal plan printables. I hope to design more printable kitchen organizing pages and tools for you to use. Share your ideas, I’d love to hear what you want most!